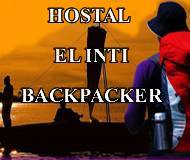 THE INTI BACKPACKER HOSTEL offer comfortable rooms married, double, triples, quadruples and single with private bathroom and dorm for lonely travels. It has a familiar atmosphere, free kitchen, Wi-Fi, cafe-bar and travel agency. The INTI BACKPACKER HOSTEL is located on Av. La Torre 137, in the downtown of Puno city, five minutes main square and the most important tourist business places of Puno city.